The roads in the thickly forested Baigachak region of Madhya Pradesh’s Dindori district are these days covered with sal seeds. After a gap of three years, sal (Shorea robusta) trees have yielded seeds in abundance, promising good returns for the resident Baiga tribe, which collects the seeds for a living. The humble sal seed yields butter used in bakery, cosmetic and pharmaceutical industries. India has the largest area under sal forest cover. In Madhya Pradesh sal trees account for 16 per cent of the forest area. But as tribal elder Nanki Bai puts it, when nature favours the Baiga, the government turns hostile. As families started collecting the seeds with the hope of getting a good price, collection centres opened on a note of disappointment for them. The Madhya Pradesh Minor Forest Produce Federation reduced the seed price to Rs 5 per kg from Rs 6 last year. In 2009, it was Rs 10. “The collection officials were earlier hinting at restoring the previous price of Rs 10. But by June-end, they fixed it at Rs 5,” says Latesh Paraste, a collection agent in Kewlari village. “In the past five days, I have received only eight tonnes. Earlier, we used to get 10 tonnes a day. All except those in dire need have stopped collecting sal seeds,” he adds. R S Negi, managing director of the federation, blames the bumper crop for the drop in seed prices. Sukrati Bai Pachgaian of Pondi village says the residents have traditionally sold a variety of minor forest produce (MFP) like lac and tendu leaves in the open market. “The price is fair but with erratic rainfall, the availability of MFPs is declining,” she says. Sal seed used to be a reliable income source, contributing Rs 7,000 to Rs 12,000 per season to the Pachgaian family kitty. “But now the federation is determined to take this income source away from us,” she adds. Nanki Bai of Baigachak region says sal seed was the staple food of the Baigas for two months a year before PDS ration was introduced a decade ago. The dried seed was mixed with ash and boiled for 14 hours till it became soft. It was then repeatedly washed to remove the bitter taste. The seed was then cooked with dry mahua flowers to make a sweet preparation called laata, or use dried, ground and added to maize or sorghum flour used for making chapatis. A paste made from the seed was used to cure diarrhoea. Sal oil, extracted through traditional cold-pressing technique, was the preferred cooking oil. “The seed is good for body strength and the oil is tasty,” says Bai. According to science research papers, sal oil does not cause artery blockage. However, with the entry of PDS rations and refined oils, the process of cooking sal seed and using its oil have been nearly given up, laments Bai. Sanjoy Patnaik, Odisha state director of NGO Rural Development Institute who has extensively written on sal trade, says the international market controls the seed price. The largest demand for the seed comes from seven multinationals that account for 60 per cent of the global chocolate and confectionary production. “Sal butter can be used as a substitute for cocoa butter, a key ingredient in chocolate,” explains Patnaik. Prices of cocoa butter keep fluctuating: it ranged between US $3,545 and US $5,841 per tonne in 2011. “So, using sal butter would mean cost-cutting to the tune of millions of dollars,” he says. But fluctuations in prices, failure of exporters to adhere to international standards and absence of a quality monitoring system affect sal butter exports, adds Patnaik. In India, sal butter cannot be used in food products like chocolate and ice-cream under the Prevention of Food Adulteration (PFA) rules. Its use is restricted to vanaspati ghee and soap. 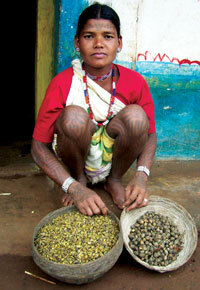 Tribals, who have calculated the price of sal seeds in terms of minimum wage, disagree. Ujiyaro Bai Kewatia of Pondi village explains, “One adult can collect 100 kg of seeds (fresh weight) in a day, but the process of drying, roasting, winnowing and pounding to remove husk and separate kernel sections takes two people and two days. This takes the total number of man-days to five for every 100 kg (dry weight).” At Madhya Pradesh’s minimum wage of Rs 183, this comes to Rs 915. 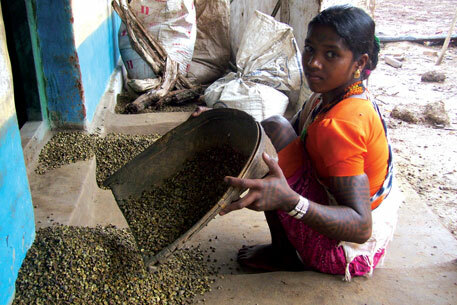 “If the seed price is Rs 10 per kg, then we make a profit of Rs 85 per 100 kg, but at Rs 5 we are at a loss,” says Kewatia. Pondi has decided not to sell any seed till a better price is announced. “Why should the federation take commission on seed sale if it can neither offer minimum wage nor protect them against market vagaries?” asks Ganesh Kaivarth of Amarpur village. He is also the office bearer of NGO National Institute for Women, Child and Youth Welfare, which is helping tribal people organise community forest rights claims under the Forest Rights Act (FRA). “Under FRA, tribals have ownership rights to all MFPs, so they should be allowed to sell sal seed in the open market,” says Kaivarth. Patnaik agrees. He says de-controlling may lead to better prices for collectors, but there could be difficulties in the absence of a uniform legislation. “In Odisha, panchayats are authorised to sell the seed, but traders are unwilling to buy it from them because they face trouble from the forest department while transporting the seeds out of the state to processing centres in Mumbai, Chhattisgarh and Delhi,” adds Patnaik. He says policy bottlenecks like the PFA rules should be re-examined to expand the domestic market for the seeds. Naresh Biswas of NGO Nirman in the tribal Mandla district says the federation has made no attempts to develop a good market linkage despite high demand for the seed from the cosmetic industry. “De-controlling could be a better option, but cheating by middlemen cannot be ruled out,” he says. The best option would be to de- control but also continue procurement by the federation. “In such a situation tribal people can decide whom to sell,” he adds.